Mustari, A., Nishidate, I., Wares, M. A., Maeda, T., Kawauchi, S., Sato, S., Sato, M., Aizu, Y. Agarose-based Tissue Mimicking Optical Phantoms for Diffuse Reflectance Spectroscopy. J. Vis. Exp. (138), e57578, doi:10.3791/57578 (2018). 将吸收系数µa和散射系数µ的初始值设置为输入数据文件中适当的值 (例如, µa = 0.01, µs = 0。1). 图 1: 实验装置的原理图.这些面板显示了测量 (a) 漫反射光谱和 (b) 总透射率谱的设置。请单击此处查看此图的较大版本. 图 2: 制备基于琼脂糖的光学幽灵的步骤.这些面板显示 (a) 表皮层幻影的制作和 (b) 制作真皮层幻影。请单击此处查看此图的较大版本. 图 3: 代表估计的幽灵的光学特性. (a) 本小组显示了表皮和真皮层的平均减少散射系数谱µs' (λ)。(b) 本小组显示了表皮层和真皮层的µ(λ) 的吸收系数谱。请单击此处查看此图的较大版本. 图 4: 代表数码彩色照片的双层皮肤幽灵. (a) 本小组显示两层皮肤幻影的横断面视图。(b) 本小组展示了含有含氧血液的 3-3 幻像矩阵的最高视图。(c) 本小组展示了含有脱氧血的 3-3 幻像矩阵的最高视图。从上到下的行有咖啡溶液浓度cc 5%, 10% 和20%。从左到右的列有血浓度Cb的 0.2%, 0.4% 和0.6%。请单击此处查看此图的较大版本. 图 5: 代表测量了从两层皮肤组织幽灵获得的漫反射光谱.这些面板显示了不同条件下的幽灵的漫反射光谱 (a) 咖啡溶液的浓度 c, (b) 全氧血浓度cb, 和 (c) 血液的氧合状态。请单击此处查看此图的较大版本. Pogue, B. W., Patterson, M. S. Review of tissue simulating phantoms for optical spectroscopy, imaging and dosimetry. Journal of Biomedical Optics. 11, (4), 041102 (2006). Cohen, G. Contrast--detail--dose analysis of six different computed tomographic scanners. Journal of Computer Assisted Tomography. 3, (2), 197-203 (1979). Seltzer, S. E., Swensson, R. G., Judy, P. F., Nawfel, R. D. Size discrimination in computed tomographic images. Effects of feature contrast and display window. Investigative Radiology. 23, (6), 455-462 (1988). Pifferi, A., et al. Performance assessment of photon migration instruments: the MEDPHOT protocol. Applied Optics. 44, (11), 2104-2114 (2005). Prahl, S. A. Project: Optical Phantoms. Available from: http://omlc.org/~prahl/projects/phantoms.html (2014). Linford, J., Shalev, S., Bews, J., Brown, R., Schipper, H. Development of a tissue-equivalent phantom for diaphanography. Medical Physics. 13, (6), 869-875 (1986). Durkin, A. J., Jaikumar, S., Richardskortum, R. Optically dilute, absorbing, and turbid phantoms for fluorescence spectroscopy of homogeneous and inhomogeneous samples. Applied Spectroscopy. 47, (12), 2114-2121 (1993). Nishidate, I., Aizu, Y., Mishina, H. Estimation of melanin and hemoglobin in skin tissue using multiple regression analysis aided by Monte Carlo simulation. Journal of Biomedical Optics. 9, (4), 700-710 (2004). Nishidate, I., Maeda, T., Aizu, Y., Niizeki, K. Visualizing depth and thickness of a local blood region in skin tissue using diffuse reflectance images. Journal of Biomedical Optics. 12, (5), 054006 (2007). Nishidate, I., et al. Noninvasive imaging of human skin hemodynamics using a digital red-green-blue camera. Journal of Biomedical Optics. 16, (8), 086012 (2011). Bharathiraja, S., et al. Multi-modality tissue-mimicking phantom for thermal therapy. Physics in Medicine & Biology. 49, (13), 2767-2778 (2004). Firbank, M., Oda, M., Delpy, D. T. An improved design for a stable and reproducible phantom material for use in near-infrared spectroscopy and imaging. Physics in Medicine & Biology. 40, (5), 955-961 (1995). Hebden, J. C., Hall, D. J., Firbank, M., Delpy, D. T. Timeresolved optical imaging of a solid tissue-equivalent phantom. Applied Optics. 34, (34), 8038-8047 (1995). Firbank, M., Delpy, D. T. A phantom for the testing and calibration of near-infrared spectrometers. Physics in Medicine & Biology. 39, (9), 1509-1513 (1994). 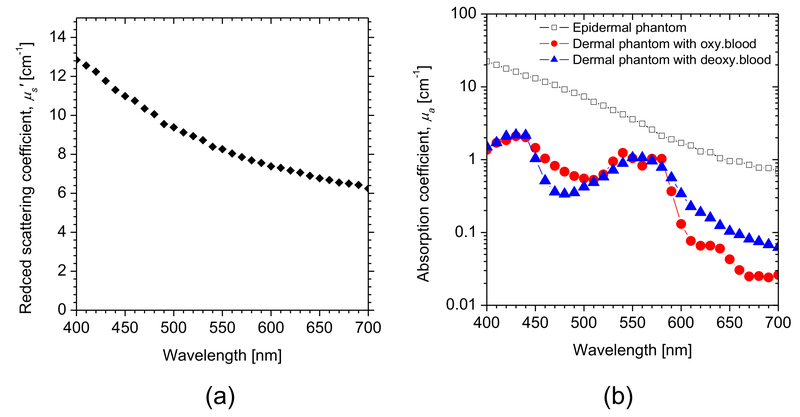 Sukowski, U., Schubert, F., Grosenick, D., Rinneberg, H. Preparation of solid phantoms with defined scattering and absorption properties for optical tomography. Physics in Medicine & Biology. 41, 1823-1844 (1996). Beaudry, S., P, Fabrication and characterization of a solid polyurethane phantom for optical imaging through scattering media. Applied Optics. 38, (19), 4247-4251 (1999). Lualdi, M., Colombo, A., Farina, B., Tomatis, S., Marchesini, R. A phantom with tissue-like optical properties in the visible and near infrared for use in photomedicine. Lasers in Surgery and Medicine. 28, (3), 237-243 (2001). Dabbagh, A., Abdullah, B. J., Ramasindarum, C., Abu Kasim, N. H. Tissue-mimicking gel phantoms for thermal therapy studies. Ultrasonic Imaging. 36, (4), 291-316 (2014). Cabrelli, L. C., Pelissari, P. I., Deana, A. M., Carneiro, A. A., Pavan, T. Z. Stable phantom materials for ultrasound and optical imaging. Physics in Medicine & Biology. 62, (2), 432-447 (2017). Vogt, W. C., Jia, C., Wear, K. A., Garra, B. S., Pfefer, T. J. Biologically relevant photoacoustic imaging phantoms with tunable optical and acoustic properties. Journal of Biomedical Optics. 21, (10), 101405 (2016). Bays, R., et al. Three-dimensional optical phantom and its application in photodynamic therapy. Lasers in Surgery and Medicine. 21, (3), 227-234 (1997). Ramella-Roman, J. C., Bargo, P. R., Prahl, S. A., Jacques, S. L. Evaluation of spherical particle sizes with an asymmetric illumination microscope. IEEE Journal of Selected Topics in Quantum Electronics. 9, (2), 301-306 (2003). Waterworth, M. D., Tarte, B. J., Joblin, A. J., van Doorn, T., Niesler, H. E. Optical transmission properties of homogenised milk used as a phantom material in visible wavelength imaging. Australasian Physical and Engineering Science in Medicine. 18, (1), 39-44 (1995). Moes, C. J., van Gemert, M. J., Star, W. M., Marijnissen, J. P., Prahl, S. A. Measurements and calculations of the energy fluence rate in a scattering and absorbing phantom at 633 nm. Applied Optics. 28, (12), 2292-2296 (1989). van Staveren, H. J., Moes, C. J., van Marie, J., Prahl, S. A., van Gemert, M. J. Light scattering in intralipid-10% in the wavelength range of 400-1100 nm. Applied Optics. 30, (31), 4507-4514 (1991). Flock, S. T., Jacques, S. L., Wilson, B. C., Star, W. M., Vangemert, M. J. C. Optical-properties of intralipid - a phantom medium for light-propagation studies. Lasers in Surgery and Medicine. 12, (5), 510-519 (1992). 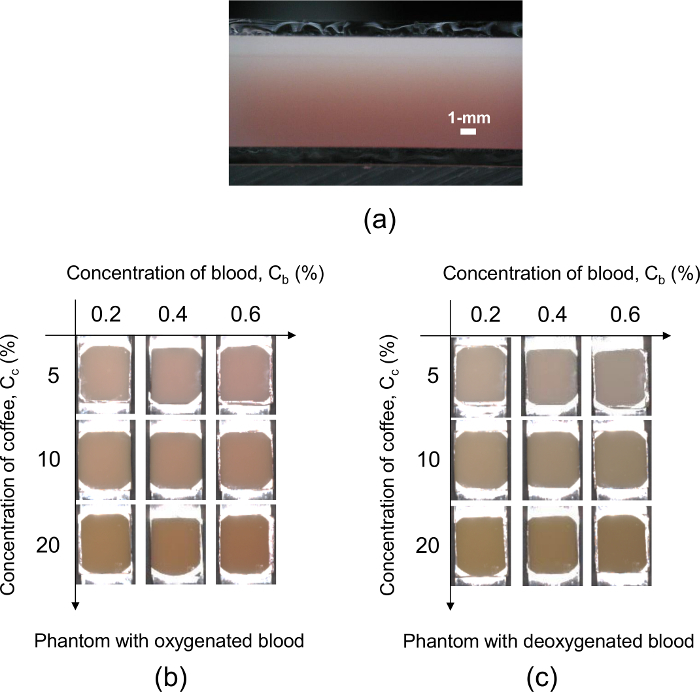 Madsen, S. J., Patterson, M. S., Wilson, B. C. The use of India ink as an optical absorber in tissue-simulating phantoms. Physics in Medicine & Biology. 37, 985-993 (1992). Cubeddu, R., Pifferi, A., Taroni, P., Torricelli, A., Valentini, G. A solid tissue phantom for photon migration studies. Physics in Medicine & Biology. 42, (10), 1971-1979 (1997). Ebert, B., et al. Near-infrared fluorescent dyes for enhanced contrast in optical mammography: phantom experiments. Journal of Biomedical Optics. 6, (2), 134-140 (2001). Yoshida, K., Nishidate, I., Ishizuka, T., Kawauchi, S., Sato, S., Sato, M. Multispectral imaging of absorption and scattering properties of in vivo exposed rat brain using a digital red-green-blue camera. Journal of Biomedical Optics. 20, (5), 051026 (2015). Lo, J. Y., et al. A strategy for quantitative spectral imaging of tissue absorption and scattering using light emitting diodes and photodiodes. Optics Express. 17, (3), 1372-1384 (2009). Bednov, A., Ulyanov, S., Cheung, C., Yodh, A. G. Correlation properties of multiple scattered light: implication to coherent diagnostics of burned skin. Journal of Biomedical Optics. 9, (2), 347-352 (2004). Hull, E. L., Nichols, M. G., Foster, T. H. Quantitative broadband near-infrared spectroscopy of tissue-simulating phantoms containing erythrocytes. Physics in Medicine & Biology. 43, (11), 3381-3404 (1998). Kienle, A., Patterson, M. S., Ott, L., Steiner, R. Determination of the scattering coefficient and the anisotropy factor from laser Doppler spectra of liquids including blood. Applied Optics. 35, (19), 3404-3412 (1996). Srinivasan, S., Pogue, B. W., Jiang, S., Dehghani, H., Paulsen, K. D. Spectrally constrained chromophore and scattering NIR tomography improves quantification and robustness of reconstruction. Applied Optics. 44, (10), 1858-1869 (2004). Ocean Optics Inc. Glossary. Dark Noise. Available from: https://oceanoptics.com/glossary/#d (2018). Friebel, M., Roggan, A., Müller, G., Meinke, M. Determination of optical properties of human blood in the spectral range 250 to 1100 nm using Monte Carlo simulations with hematocrit-dependent effective scattering phase functions. Journal of Biomedical Optics. 11, (3), 34021 (2006). Nishidate, I., Aizu, Y., Mishina, H. Estimation of absorbing components in a local layer embedded in the turbid media on the basis of visible to near- infrared (VIS-NIR) reflectance spectra. Optical Review. 10, (5), 427-435 (2003). Friebel, M., Helfmann, J., Netz, U., Meinke, M. Influence of oxygen saturation on the optical scattering properties of human red blood cells in the spectral range 250 to 2000 nm. Journal of Biomedical Optics. 14, (3), 034001 (2009). Jacques, S. L., Glickman, R. D., Schwartz, J. A. 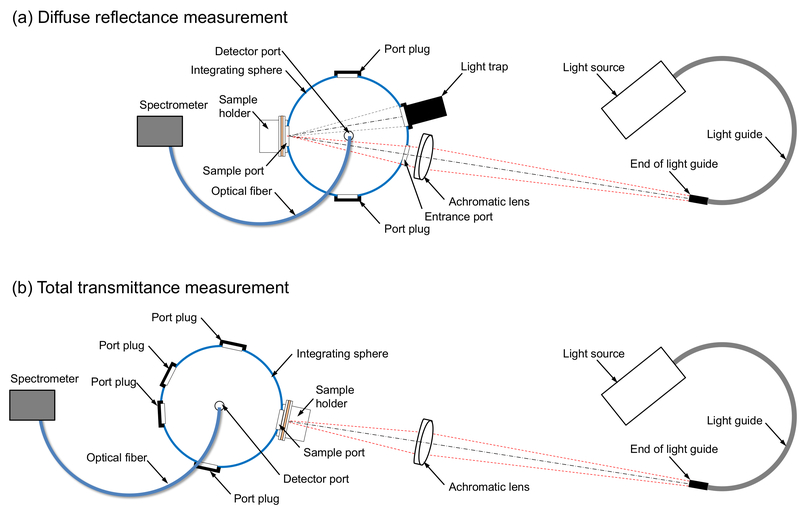 Internal absorption coefficient and threshold for pulsed laser disruption of melanosomes isolated from retinal pigment epithelium. SPIE Conference Proceedings. 2681, 468-477 (1996). Park, J., Ha, M., Yu, M., Jung, B. 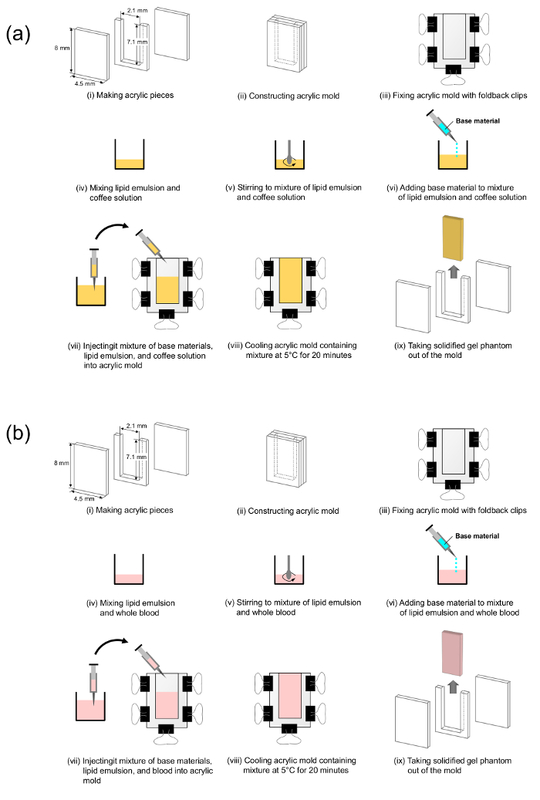 Fabrication of various optical tissue phantoms by the spin-coating method. Journal of Biomedical Optics. 21, (6), 065008 (2016). Jacques, S. L. Skin Optics. Available from: https://omlc.org/news/jan98/skinoptics.html (1998). Prahl, S. A., van Gemert, M. J. C., Welch, A. J. Determining the optical properties of turbid media by using the adding-doubling method. Applied Optics. 32, (4), 559-568 (1993). Hale, G. M., Querry, M. R. Optical constants of water in the 200-nm to 200-um wavelength region. Applied Optics. 12, (3), 555-563 (1973).